Ok. This rounds’s over. Irma has left the ‘hood — trashing the Keys but possibly not as badly as she could have. 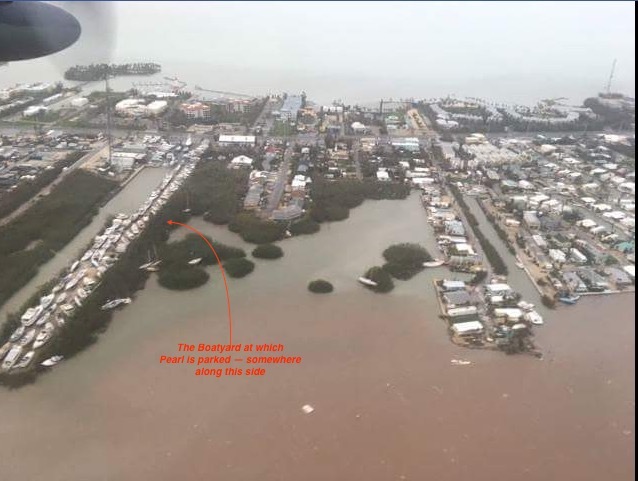 Most of our friends in the Keys should be ok. We haven’t managed to reach a few of them who stayed, but the surge, etc., didn’t seems to be as bad as it was made to sound (in Key West). We have no idea as to how people’s boats that were left in the water faired. Keep your fingers crossed. Remember, some of these boats were also their only home. Pearl may have come through Irma intact. The boat yard where she was stored seems to have come though ok. She is likely still on the stands that she was on before the Hurricane. The attached picture offers a clue. The boat yard where Pearl was at is in the far left of the attached picture. The last pictures of Pearl we received from before Hurricane Irma show her racked somewhere along the hedge on the right side of the row. Most of the boats seems to be upright and intact so we hope Pearl’s one of them. While we may have been lucky, there are many other people who have lost everything, homes, pets, boats, … the things that make up their lives.